You are here: Home / Cruise Reviews / The Verdict: Is Hapag-Lloyd’s Europa The World’s Best? In an earlier post, I promised to give a verdict to the question: Is Hapag-Lloyd’s Europa the world’s best cruise ship, as some guide books have proclaimed? There’s no question that Hapag-Lloyd’s flagship has the makings of a best-in-category ship. As noted before on Avid Cruiser, Europa is ranked 5 Stars Plus by the Berlitz Guide to Cruising & Cruise Ships, a distinction no other ship can boast. Europa, however, has some challenging competition. Certainly, Seabourn Cruise Line’s new Odyssey is a force to be reckoned with. How do those two compare? For those who prefer a newer ship, Odyssey was launched in 2009. Europa, on the other hand, celebrated its 10th birthday in 2009. Despite being a decade old, however, the well-maintained and continually updated Europa is in exceptional condition. 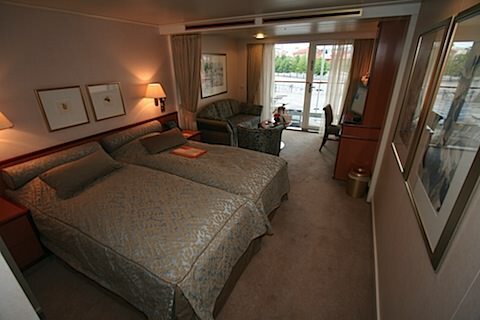 Staterooms on both ships are comparable, though Odyssey’s are more modern than Europa’s (pictured). Europa wins out in the pool area (its pool is larger than Odyssey’s), but Seabourn’s newest ship has a better pool grill, with more selection and better flow. And while the observation is totally subjective, I prefer Odyssey’s Colonnade restaurant over Europa’s Lido Cafe. That said, Europa’s Oriental restaurant impressed me more than Odyssey’s Restaurant 2. 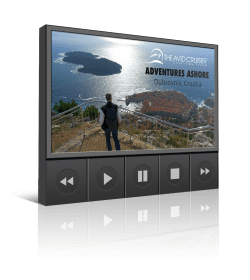 I could find similar features and facilities that I think are better (or worse) on Crystal Cruises, Silversea Cruises, Regent Seven Seas Cruises and SeaDream Yacht Club. Ships operated by these companies also could rank as world’s best — and often do. Europa caters to the German market, although English-speakers will find it easy to get by and get around on Europa. Some cruises are designated bilingual, and Germans, especially young Germans, speak English with admirable alacrity. Soft drinks, water and alcohol are not included in Europa’s cruise fare. On the other ships operated by cruise lines previously mentioned, they are, except for alcohol on Crystal (Crystal became all-inclusive in 2012). And just as Europe does, the other cruise lines pour quality brands. 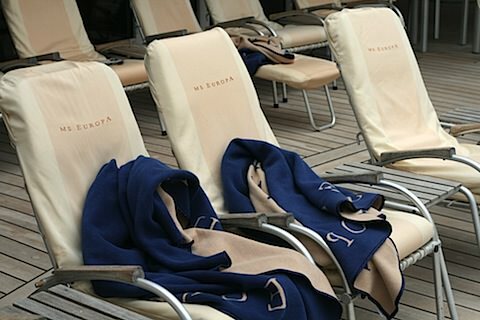 Silversea pours Perrier-Jouet for free; Europa charges about €10 for a glass of Veuve-Cliquot. On Europa, however, you won’t need to dole out extra for a beer, soft drinks, water or juice from your stateroom fridge. Higher-category suites also come with a stocked bar. And speciality coffees carry no charge shipwide. Gratuities are included in the cruise fare, but Europa literature notes that “it is customary to tip service personnel as an acknowledgement of good service.” No guidelines are provided. 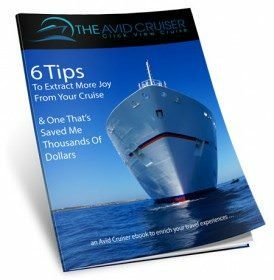 Crystal also encourages gratuities for crew, but the other cruise lines mentioned here do not. To North Americans accustomed to an “inclusive” luxury cruise (Regent even includes shore excursions), the extras put Europa at a competitive disadvantage. (Crystal Cruises became all-inclusive in 2012). Built in Helsinki in 1999, Europa carries 408 guests when sailing at maximum capacity. The ship features 156 Veranda Suites measuring 291 square feet, with some of the most attractive (teak deck) balconies I’ve seen at sea. In addition, there are 36 non-Veranda Suites measuring the 291 square feet; 10 Penthouse Deluxe Suites, measuring 484 square feet; and two Penthouse Grand Suites, sprawling 915 square feet. Europa features four restaurants: Oriental, serving sushi, sashimi and Asian foods; Venezia, serving Italian; the main dining room (single, assigned seating); and the Lido Cafe, open for breakfast, lunch and dinner. Europa has seven bars and three lounges, including an attractive cigar lounge called the Havana Bar. Smoking is permitted in public areas and on verandas. Suites are equipped with something rarely seen on ships these days: ashtrays. Smoking in the suite, however, is discouraged, and the smoking policy will become less lenient in 2010. Also on Europa: fitness center; wrap-around promenade deck; golf simulator; putting green; children and teen facilities; ironing room; business center; boutique; Zodiacs for spontaneous excursions; gallery instead of casino; and more. On board currency is the Euro, not necessarily the preferred currency of North American travelers. 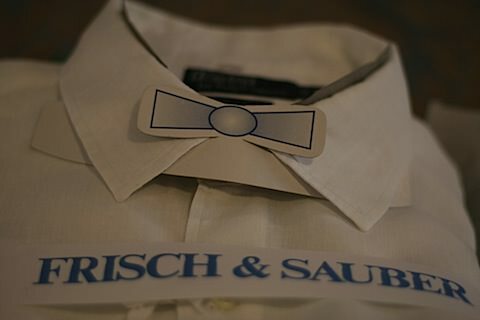 There were many nice touches, such as the way laundered shirts were returned, “fresh and clean” and with a paper bow tie just for fun. 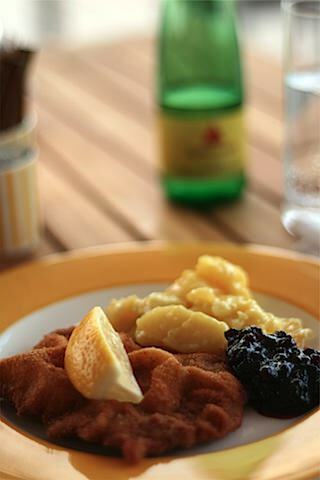 Cuisine is international with, as you might expect, some German-inspired dishes, such as sausages and Wienerschnitzel with potatoes. Europa features internet at reasonable rates — in room, using ethernet, or through wifi offered in public areas. Dress is casual during the day; during the evening, suits for gentlemen and corresponding dress for ladies. Would I name Europa world’s best cruise ship? No. With so many competitors who are so good at what they do, Europa proved to be no better than the other ships in the luxury category. Yes, Europa certainly ranks up there in the league of the world’s best — just not the best, elevated above all of the others. 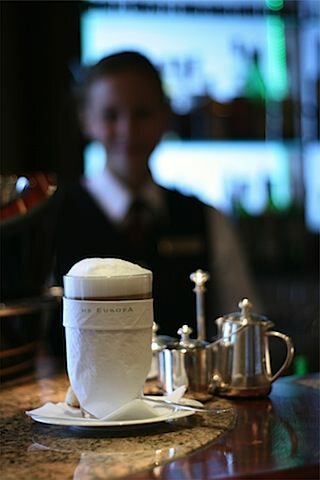 I will, however, give Europa one world’s best: Best Latte Machiatto on a luxury cruise ship. And here’s something to like: You can have all you like — at no additional charge. I must disagree with you Ralph, I have traveled on all of the luxury ships you refer to in your piece and without a doubt the EUROPA is the best ship in the world to me. The EUROPA does customer service better than anyone else in the industry. I also love the feel of traveling on a German ship with so many international passengers. Having to pay for a soda is irreverent to me. Happy birthday EUROPA, wishing you another 10 years of success. Service was extremely refined, professional and personal on Europa, no question. Great staff. 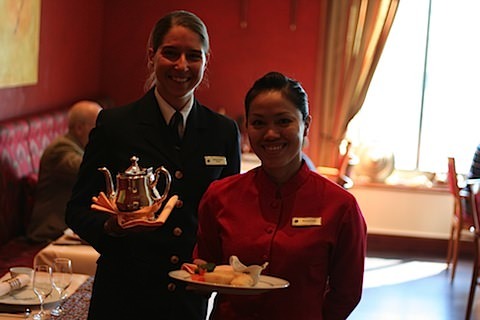 The best service I’ve experienced, however, was on SeaDream Yacht Club. I uploaded Counter Cruise: SeaDream Yacht Club which appeared in the Fall 2007 issue of Avid Cruiser if you’re interested. Crystal has impressed me on several occasions also. I remember once I was headed to the gift shop to buy a tie on Crystal Symphony. I met the hotel director, Sasha, on the way, and when I mentioned where I was headed, he instructed me to sit down and have a drink. He returned several minutes later with a tie from his stateroom, draped it around my neck and tied a perfect Windsor knot, saving me the expense of a tie. As for sodas, alcohol and water not being included in Europa’s cruise fare, the latter brought a few complaints. A few German passengers were not happy about having to pay for bottled water, but of course that didn’t diminish the service provided by Europa’s staff. It was only a minor annoyance. I have travelled once in MS Europa and I have to say it was the most incredible trip I have ever made, it was absolutely perfect in all… but the shows, they were all too “german oriented” and the musitians were not really high level. The Oriental Restaurant was the best -amazing food- and the Lido Cafe “Al Fresco” tables were really magical with this great views… amazing the “Lobster Journey” with all different plates based on Lobster, and the incredible service on board. Thanks Mike. 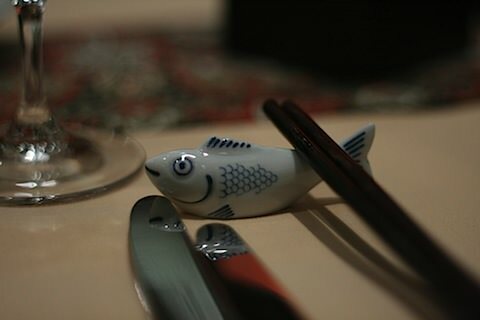 I agree about the Oriental restaurant. Service and food were outstanding. Another favorite is Oceania’s Terrace Cafe. Check out this photo of the Terrace Cafe when Oceania’s Regatta overnighted in beautiful Bordeaux. I completely agree with Tom. MS EUROPA is world-s Number 1. 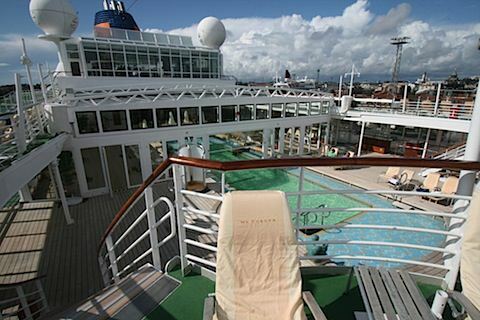 The design of the ship is outstanding : high ceilings for one, a proper pool, and a fanastic gym. Real flowers. Proper Duvets. Fantastic beds. 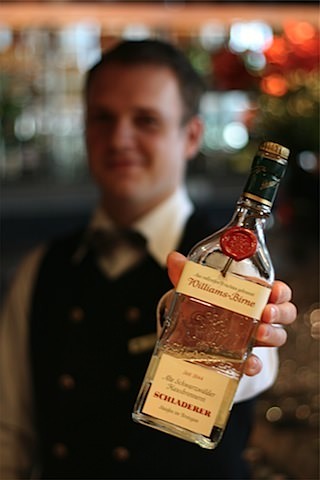 Refined Service. Truly world class entertainment (if you enjoy classical music, that is). And, if you speak German, the lectures are first rate and university level (not the easy going, light stuff you get on most other ships). Seabourn Odyssey, by comparison, is a more modern vessel – but, its owners (Carnival) crammed 50 more passengers into a similar sized ships (= low ceilings). No refined dining whatsoever (eager service, yes, but lacking in style and refinement). 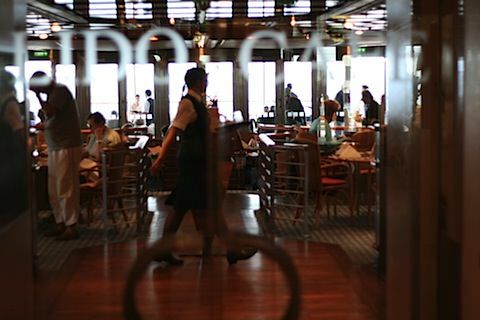 The main restaurant aboard Seabourn Odyssey suffers from incredibly poor (fluorescent) lights. Suites on the Odyssey are equipped with poly-filled duvets and fake flowers. Having said that, the Odyssey is has lovely outdoor spots, including whirlpools both aft and front (quite lovely in terms of sunsets and sunrises). Happy birthday EUROPA, wishing you another 10 years of success. She is truly world class in every sense! Check out my blog, “Das Boot” here on Avid Cruiser for a slightly different look at Europa. In our contract we made with Hapag Lloyd (for a cruise on the Baltic) we made a special paragraph about smoking cigars in the smoking area’s of the ship. These are six area’s where smoking is allowed and we had the permission to smoke cigars as well in these area’s. We made this agreement on forehand, without it we would not have booked this cruise. During the trip (already ont the second day) the hotel manager told us he would not allow to smoke cigars, allthough it was a commitment between us (the clients) and Hapag Lloyd (the company). You learn hereby that you cannot trust Hapag Lloyd making contracts: they only agree to selle the journey and when booked they are not the gentlemen you would think they are.